Mixing slots with video poker has never been more fun, or more lucrative. Click here to play! Join in on this new sensation of online gaming today for your chance to pick up spectacular profits. 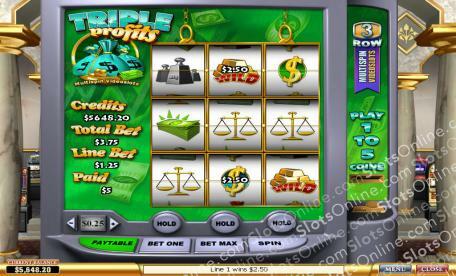 Triple Profits is a 3-reel and 3 row multispin slot that will change the way you think about typical slot machines. The Gold Bars are Wild and can be substituted for any other symbol on the reels except Bonuses in order to complete winning combos. If you end up earning all three Wilds in one spin you will win yourself 1000 times your original stake! The Bonus Game can be activated when you spin up all three Stacks of Cash across active pay lines. The Calculators, Scales, and Safes will also help bump up your bank balance as well. Jump into the land of Triple Profits today, and walk away wealthier for your efforts! The Gold is Wild and can be subbed for any other symbol to finish winning combos, as well as paying out up to 1000 coins. The Stacks of Cash are bonuses and when three appear on an active pay line you will be sent straight to the exciting Bonus Round.